Forget about all those watches that track your health and notify you of the juiciest stuff on social media - here's one that tries to set itself apart from that trend. 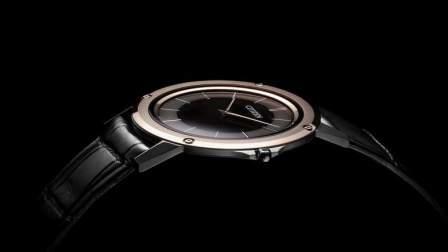 Japan's Citizen on Saturday unveiled its Eco-Drive One timepiece, which it claims to be the world's thinnest watch with a 1mm 'thick' movement, 2.98mm case and a 39mm diametre. So how does that compare to the rest of the field? If the slimmest pieces listed in a recent report by Watch Time magazine are any reference, Tokyo-based Citizen's creation beats everyone by a mile, er, millimetres. The Bulgari Octo Finissimo Minute Repeater's case is 6.85mm, the Jaeger-LeCoultre Master Ultra-Thin Minute Repeater Flying Tourbillon is at 7.9mm, the Vacheron Constantin Patrimony Contemporaine Ultra-Thin Calibre 1731 is at 8.09mm and the Piaget Altiplano 900P is at 3.65mm. Others on the list are the Arnold & Son UTTE at 8.34mm and the Bulgari Octo Finissimo at 5mm. The water-resistant Eco-Drive One - with a 39mm diameter - was launched by Citizen to mark the 40th anniversary of its light-powered technology, Eco-Drive, which can generate power from any light source - be it artificial or natural, and even dim lights, which keeps a watch going without having to replace its batteries. The case and band are made of Citizen's own Duratect surface-hardening technology - increasing scratch-resistance - and crocodile leather, while its crystal is made up of sapphire with anti-reflective coating.